So here’s the continued story of Orange Bike. It’s been almost exactly a year since my little orange TransAM was stolen from a public bike rack on the DTES, and if there’s a moral here it’s that it’s always worth holding on to hope. I never meant to buy this bike. I went out to Coquitlam to pick up a fork for the build I was working on, but the fork was still attached to a bike and the seller convinced me to take that as well for a few extra bucks. It didn’t look like anything much: a very beat up steel frame in a ludicrous shade of orange, attached to an assortment of worn out components and a really nice fork. Still, I figured I could stick one of my old forks on it, sell it, and probably come out well ahead. But when I got home I took the orange bike out for a ride, and even though barely anything on it worked properly (the chain was stretched, the cassette teeth ground down to nothing, the brakes sloppy and disparate) something clicked. Before I even got around the block I knew I wasn’t going to be selling this bike. I cannibalized the build I’d just finished for replacement parts, and then the orange bike and I went on adventures. It became my go-to commuter, my urban playground bike, my after-work trail machine. I flew it to California and rode the dusty desert singletrack of Fort Ord and Toro Regional Park. It hung out by the ocean where the surf was breaking. It tipped me over the bars on Victoria rock rolls and held its own admirably on Hartland trails in the pouring rain. It shouldn’t have been a high theft risk. The frame was chipped and dented, the decals peeling and discoloured; only the fork gave away that there was actually an awesome little chromoly trail machine hiding under that battered exterior. And it’s likely the fork that it was stolen for; I can’t imagine anyone bothering for the frame. 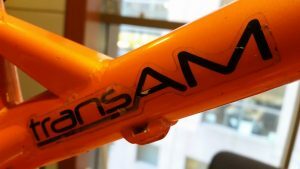 But it did get stolen, and even though I somehow managed to find another 2011 TransAM – one in far better condition than the orange bike – it was never quite the same. I’ve missed that bike on every single ride it wasn’t there for. Cut to eight weeks ago. On PinkBike, where I’d repeatedly thought that I should just kill the reward notice I posted and give up hope that the orange bike might ever come home, I got a message from someone who’d bought a battered but surprisingly good quality steel frame at the Vancouver flea market and was a bit suspicious about his good fortune. 10 months on, I did not want to allow myself to hope. I sent him the serial number and tried to put it out of my mind. Until the most surprising message of all came back: the number matched. It took a while to meet up. Each time we didn’t manage to connect, I reminded myself that this was such a ridiculously long shot in the first place. Then today I got a text: he had a free day, did I want to meet at lunchtime for the handover? We spent a half hour dancing around each other at Starbucks because he had assumed he was looking for a guy. And then he gave me a black plastic garbage bag with a bike frame wrapped inside, and I gave him a Starbucks gift card because he refused to take the reward I’d offered but I knew he liked coffee, and the orange bike came home. Don’t ever lose faith in humanity; there are very, very good people out there. There’s some rebuilding to do. But the little orange bike, the bike I loved the very most, is back where it belongs. Happy new year. 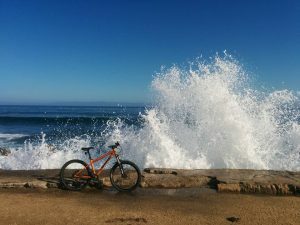 This entry was posted in Biking, Gear on January 3, 2017 by Kay.